I consider myself to be a pretty low maintenance chick as my style has barely changed over the past 15 years. Even though it only happens on a rare occasion, I love dressing up for date nights or special occasions. I usually scoop up a piece of jewelry when it catches my eye and hold on to it for years even before wearing because I know I will find the perfect time! So when I was asked to review a piece from the company Jinja Jewelry, I was very interested in seeing what they had to offer and if it would fit my style. "Jinja Jewelry offers a large selection of breathtaking, handmade jewelry from Bali including necklaces, pendants, bracelets, earrings and rings." Right away the unique stones and colors caught my eye. I love natural, island looks where it seems as if it is something that washed up on shore and was handmade. This is exactly the style which Jinja portrays. 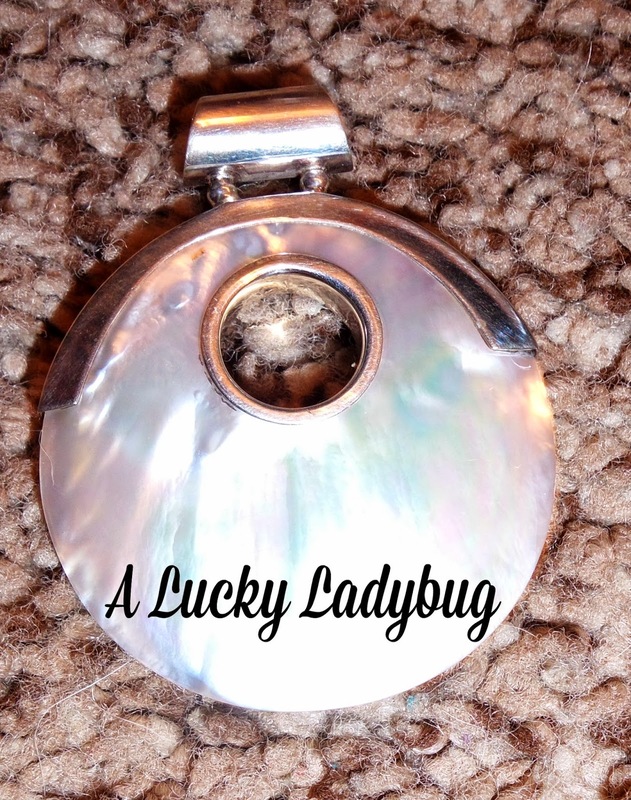 I was sent over a Mother of Pearl sterling silver pendant to review. This pendant comes with a hole in the top middle of it and hangs flat. It is also available in red or blue coral but the mother of pearl style seems to be the most universal as far as style. 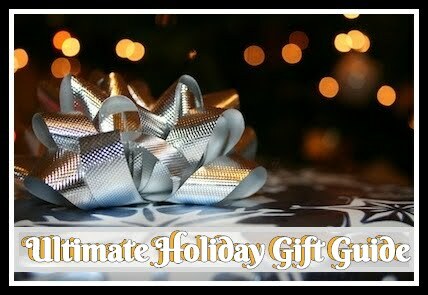 This can be paired with most kinds of clothing and even other earrings. While I loved the piece, I haven't found myself motivated to match it with anything just yet. 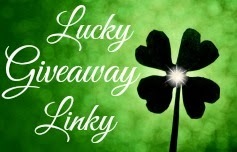 Giveaway: Jinja Jewelry is going to give one of A Lucky Ladybug's lucky readers the same Sterling Silver Pendant I received to have of their own! I love the Jinja Mabe Pearl ring! I would LOVE to also have their Hammered Sterling Silver Hoop Earrings! I like the Jinja flip flop earrings. I like the jinja ring SKU: RG-08028Black shell. The JINJA FLIP FLOP earrings are a WINNER. I like the Mabe Pearl Ring. I like the frangipani flowers bracelet. I love the Jinja earrings.....Sterling Silver 10x10 square available in Red coral, blue coral and black coral. I like the silver bracelet ELE-BR-09007. I love the Sterling Silver Mother of Pearl heartshape design pendant.. 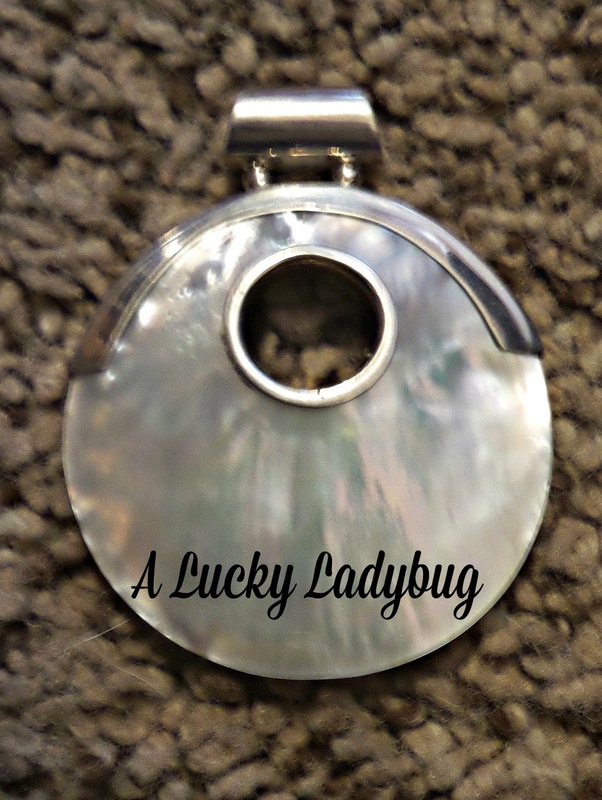 I love the Sterling silver 4.5 oval gray mother of pearl and abalone shell pendant!! I like the hammered sterling hoop earrings ! I like the Jinja Twist Bracelet! My wife loved the Sterling Silver swirl bangle. I like the jinja earrings are cute. I love the Jinja Pendant, Sterling silver shell pendant, available in red coral, blue coral, black shell, aqua shell and purple. It's so unique and beautiful! My favorite is the Jinja Earrings. I love the bracelet with the banded fossil agate beads. The jinga rings are gorgeous!! The Jinja rings and the swirl bangle! I love all of the rings! I love the Jinja Twist Bracelet in Blue. 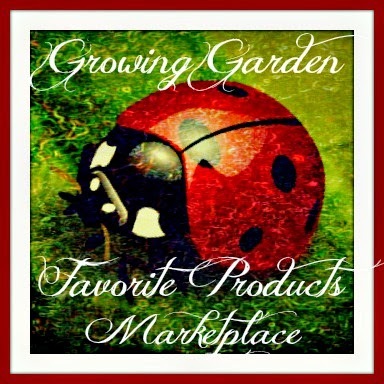 I guess you can tell by the number of times I have entered your sweepstakes contests that I love your blog! I like the Jinja Twist Bracelet in Blue. the Jinja Ring with Sterling Silver abstract free style ring with Peridot, Garnet, Bllue Topaz, Amethyst and Clear quartz gemstones. I'd like to have the Short Mixed Bead Necklace. It would go with any outfit. I love the sterling silver flip flop pendants! I really like the Jinja Bracelet and the flip flop earrings! i love the Sterling Silver double spiral ring with black onyx or mabe pearl setting! i want to get the Jinja flip flop earrings. I would like to have the Jinja Ring Sterling Silver large chunky ring, red coral. Stainless steel tube bead cuff w-white coral and white agate beads and w-rhodium beads. It's gorgeous!